While most people in the country have been stuck in some form of a blizzard/snowstorm/real winter, I have been spending my January and February in southern California and Arizona! Last week, my grandma Ruth, who lives in the Los Angeles area, came to visit me at USC and we got lunch together. It was great seeing her and I am so thankful to be close to family while I am traveling this semester. She told me about all of her volunteering efforts and community activities lately- I hope I can be as active as she is when I retire! Most recently, I got to spend Valentine’s Day weekend at Arizona State University! I visited Delta Xi Chapter during Formal Recruitment last August when it was over 100 degrees, so I was pleasantly surprised by the beautiful 80 degree weather in February. Tempe/Phoenix actually has perfect weather eight months out of the year, which I didn’t even realize until now! I loved seeing the members again and getting to know them better this time around (surprisingly, I remembered most of their names!). I loved that they took me to a lot of local restaurants and showed me around Tempe, although I felt like I was in a constant state of “full” the entire visit! Some of my favorites were acai bowls at Thrive, traditional English pasties at Cornish Pasty Company (Valentine’s Day date with two of the members 🙂 ), a healthy lunch outside at D’Lish, and specialty wraps at Chopshop. Right before I left for the airport, I was even able to grab lunch with a fraternity consultant from Alpha Kappa Lambda, which was great! I have met up with a few other consultants at SDSU and USC, and it is always fun getting to know people from all over the country doing the same job as I am. 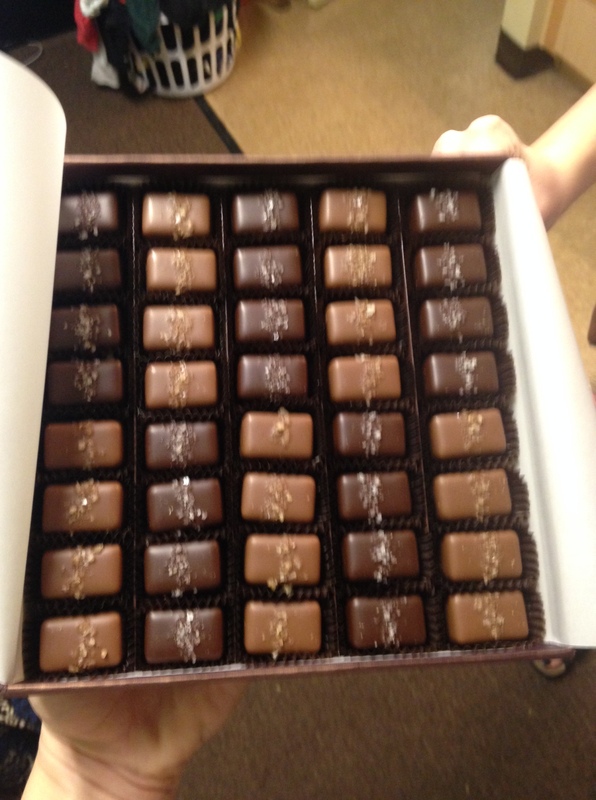 For Valentine’s Day, my mom sent me a package of Frans sea salt caramels, which are AMAZING! 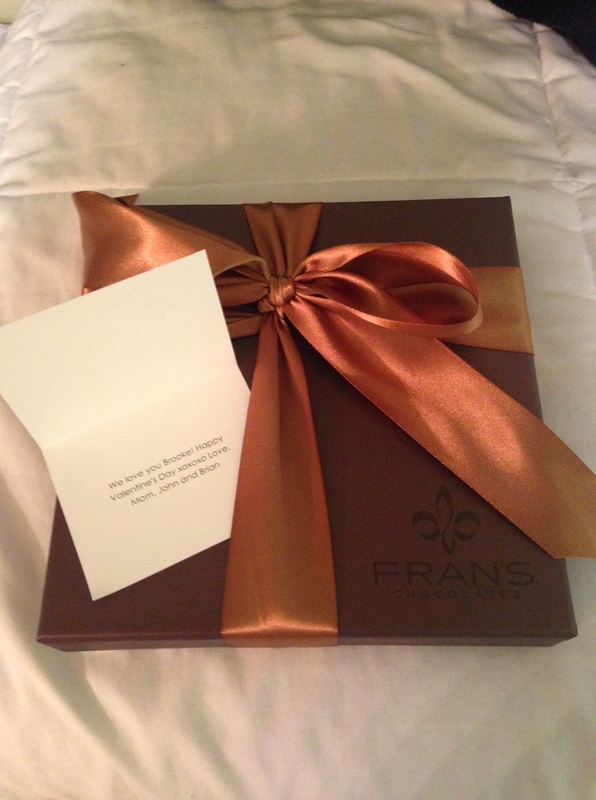 If you ever get a chance to try Frans chocolates, you definitely should. Thanks mom! 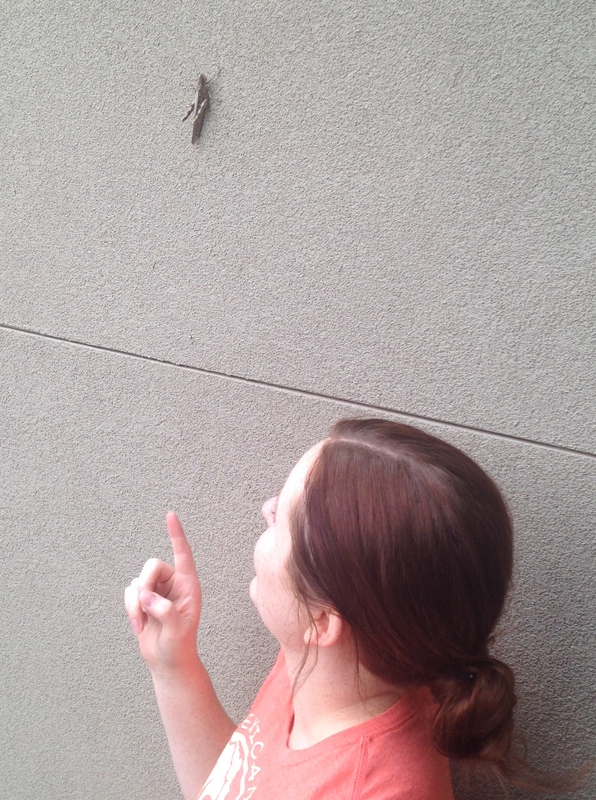 We found a huge grasshopper on the wall of the Alpha Gam housing complex- gross! 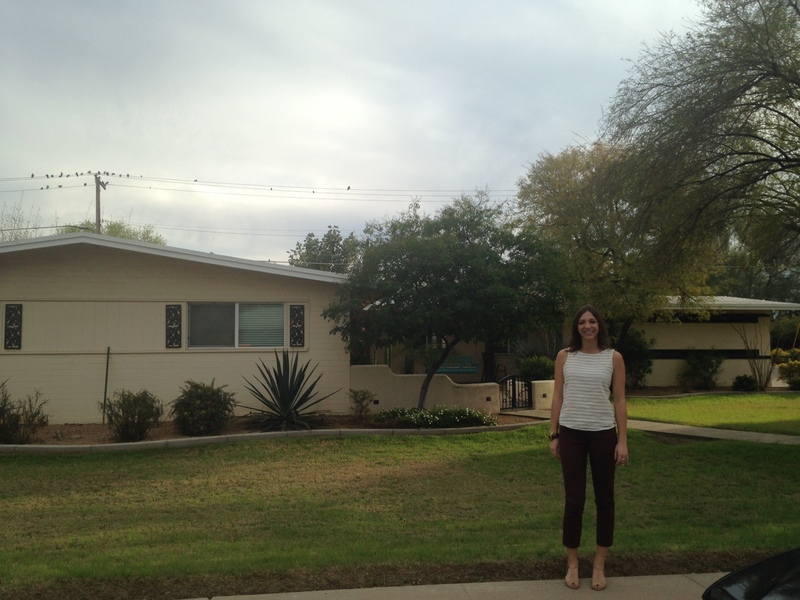 One of the highlights of this visit was being able to visit my great grandma’s (GGMom) old house in Tempe. My GGMom was a professor at ASU back when it was a teaching college and my grandma Diane grew up there. Both my grandma Diane and grandpa Bob went to ASU, so there is a lot of family history there! My grandma gave me directions to the house and thanks to Google Earth, I found the house she grew up in for part of her childhood. It was exactly how she described it from the 1950s, so it was amazing to see a little piece of history less than a mile from where I was staying. It was really special for me to see a piece of my great grandma’s life, who passed away three years ago. 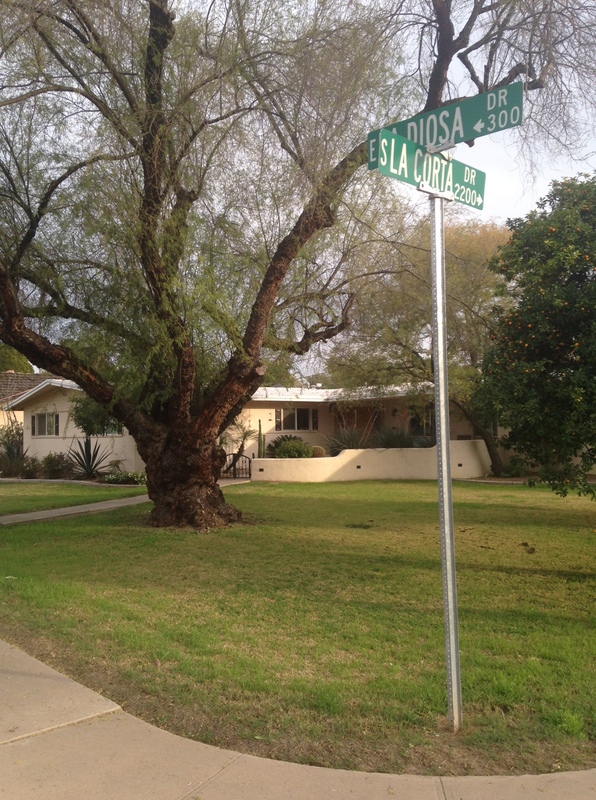 Here are some pictures of the La Diosa house! I am back at SDSU this week for the last time until April, so I am trying to see as many members as I can before I leave! I have really gotten close with a lot of the Alpha Gams here, so it will be hard for me to part with them at the end of the semester. Bridget, one of my best friends who lives in San Francisco, is coming down to San Diego to visit our friend Daniella this weekend, and I can’t wait to see them both! On Sunday, I will head back to USC before I get a few vacation days in the beginning of March- woohoo!